Eaton 1-Pole AC/DC operated timing relay is rated at 24 - 240-Volt AC/Volt DC input and 250-Volt AC output. The SPDT contact configured relay is comprised of multiple user selectable timing functions and timing ranges. Compact relay has dimension of 0.69-Inch x 2.56-Inch x 3.43-Inch. Advanced LED indication of this relay allows for easy troubleshooting. Staggered terminal locations provide convenient access to lower-level terminals after wiring. IP40 rated relay withstands harsh environmental conditions. 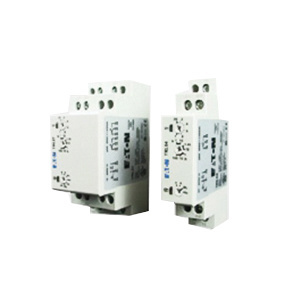 DIN rail mountable relay operates at temperature range of -25 to 55 deg C. Relay is covered by self-extinguishing plastic housing for added safety and durability.